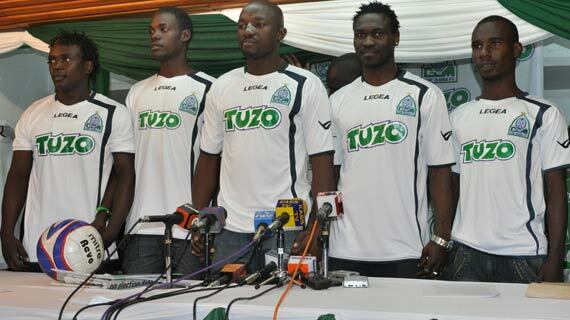 2012 was a year with plenty of ups and downs for Kogalo. The club came close to pulling of a miraculous win the Tusker premier league after most had left the club for dead in mid season. However the club was able to clinch the Super 8 trophy and the FKF cup thus earning a ticket to the 2013 CAF confederations cup. Before the season started, Gor Mahia advertized for a coach. There were dozens of applications including from foreigners. Gor Mahia took the safe route and settled for Anaba Awono. In hindsight this was a mistake because Awono with his poor communication skills was unable to command the respect of players and enforce discipline. Plus he had no control over club activities including the recruitment if players. Long time fan favourite Eric Masika shocked fans when he decided to leave Kogalo to join rivals Ingwe. After plenty of tug and pull between the two clubs, they finally settled on a transfer fee. Also leaving the club was Wycliffe Ochomo who joined Ulinzi. In a bid to make amends and to strengthen the club for continental football, club officials went on a signing spree. In came Rama Salim, George Midenyo, Ali Abondo, Wycliffe Kasaya, Yusuf Juma, Ivo Mapunda, David Owino, Ibrahim Kitawi, Hugo Nzoka from SoNy Sugar and most notably Felix Nwosu “Felixinho”, Donald Mosoti and Anthony “Balotieno”. Felixinho soon ran afoul of the club after he sent threatening text messages to coach Anaba Awono who had posited that Felixinho was simply an average player pausing as a superstar. Felixinho soon apologized to the club and fans via online posts. But only days later he was dropped by the club and supposedly demoted to the non existent B team. As for Balotieno, much was expected from him. Many thought he was going to be the next superstar after he gave Gor Mahia defenders a torrid time when the club toured Kisumu in December of 2011. Meanwhile Gor Mahia offloaded several players. Most notable was the flashy Hajji Mwachoki and long serving skipper, Julius Owino. After much hue and cry, Owino was reinstated to the club as the chief scout. After pursuing Rwandese sensation, Meddie Kagere for several weeks, Kogalo finally gave up after his club demanded KSH 4 million. Still Gor Mahia seemed content with the return of Camerounian Baldwin Ngwa. And when Gor Mahia held El Merreikh 1-1 in a friendly, it looked like they were on their way to success. After all this was ateam that only 2 years earlier had whitewashed Kogalo 5-0. It did not quite work out. Perhaps the greatest lesson from this is that signings should be done by a qualified technical bench and not by members of the Executive Council. February: Things start to unravel. In the 1st week of February, Gor Mahia went down to Tusker on penalties in the 2012 Super Cup. Loosing to Tusker on spotkicks on its own was not bad. But Kogalo fans weree befuddled as to why only one player (Rama Salim) scored his penalty as 3 others missed. Soon Gor Mahia faced an injury plague. No less than 10 players had suffered stress related injuries : Edwin Lavatsa, Demonde Selenga, Hugo Nzoka, George Midenyo, Solomon Nasio, Kevin Omondi, Baldwin Ngwa, Ivo Mapunda and Dan Makori ). Something was clearly wrong and it came at a time when the club was preparing for their first league match and for the 1st round tie with Ferroviario. Gor Mahia much later remedied this by hiring a qualified physiotherapist. Matters finally came to a head when Gor Mahia went down 0-3 to Ferroviario in Maputo. Yet this was a team that many though Gor Mahia could overcome. It was then that it started to sink in that that the club was in crisis. The disciplinary problems of defensive midfielder Collins Okoth “Gattuso” started to bubble to the surface after he was sent off by the match referee. When newly promoted Muhoroni Youth beat Kogalo 1-0 in a midweek match, the fans were up in arms and demanded answers. The club reacted by sending the entire technical bench including Awono, Ouma Ole Tunda, Julius Owino and Zablon Otieno “pro”, as well as team manager Jolawi Obondo packing. In came club legend Bobby Ogolla as head coach assisted by former harambee stars striker Tom Ogweno. It later emerged that there was plenty of infighting amongst the bench and hidden agendas amongst EC members some of whom sought to dictate who should play. The infighting had seeped into the playing unit with players picking sides. But before the new technical bench could settle, Tusker inflicted more pain when they beat Kogalo 2-0. Next up was rivals AFC Leopards and fans expected the worst. But Kogalo gave a good account of themselves holding the then high flying Leopards 0-0. That match will of course be remembered for the fracas that ensued when Ali Abondo was sent off for a clumsy challenge. The match was held for 10 minutes. Embattled AFC chairman played to the gallery by demanding all points from the match and even vowing never to play Gor Mahia again. Gor Mahia were now barred by Supersport as well as Nyayo stadium. The next matches vs SoNy and Rangers also ended in disappointing draws. As if things were not bad enough, combative midfielder, Collins Okoth announced he was quitting the team citing threats from fans after he missed a crucial penalty. By then however most fans were fed up with his antics and no one lost a wink of sleep at his departure. With Bobby overwhelmed, Gor Mahia recruited Zdvarko Logarusic who had been coaching in the Ghanaian league. However even with the arrival of Loga, the clubs fortunes did not turn around immediately. Meawhile arch rivals AFC were flying high under coach Koops. Carol Radull the famous TV personality poked fan at Gor Mahia saying “I guess not all foreign coaches are as competent as Koops“. Logarusic soon indicated that club officials were hindering him from making much needed changes. When Ulinzi beat Gor Mahia at Afraha, the club was left with no option but to listen to Logarusic. The club now had 1 win 4 losses and 4 draws and was in the relegation zone. Players grumbled about unpaid signing bonuses. Logarusic soon stated that he planned to purge the club of several players whom he termed rotten potatoes. “Some of them give their best but their hundred percent is not enough for a big club like Gor Mahia” said Logarusic. Little did he know that most of these players were recruited by EC. He had also introduced much needed discipline including a gag order forbidding players from talking to the media or calling officials many of whom were responsible for the disunity in the playing unit. Finally after a long drought, Gor Mahia beat former league champions and later beat City Stars 2-1 and it seemed the stormy waters were finally calming down. As the mid season transfer season arrived, Logarusic finally made good his threat to overhaul the team. Gone was Fan favourites Ibrahim Kitawi, Joseph Kiplagat, Duncan Owiti and Baldwin Ngwa as well as Hugo Nzoka, Demonde Selenga, Dan Makori, Tony Nyang’or, Collins Okoth, Collins Omondi, Peter Juma and Felix Nwosu. Some players reacted with shock ; “If it is based on performance, I should not have been targeted because there are some strikers in the team who are yet to score even one goal,” said Hugo Nzangu. To replace them, Gor Mahia targeted Dan Sserunkuma of City stars and another Ugandan striker Eddie Mubiru who had been training with the club. In the end they could not sign Mubiru. But in came Itubu Imbem. The second leg started on a sound note and by the end of July Gor Mahia had gone 6 games without a loss including wins over Chemelil, KCB, but the empahtic 4-0 win over City stars is what announced to the league that Gor Mahia had fully recovered from their abysmal start. The forwardline combination of Rama Salim and Dan Sserunkuma was sending shivers down opposing defenders. Gor Mahia went on to win 7 consecitive matches. An interesting moment came when Logarusic stormed the Kenya U-23 training camp to remove Rama Salim after he had been ordered to report to camp. Coach James Nandwa was not amused. But Logarusic was trying to keep Rama who was still nursing a sligh injury from re-injuring his foot. Further drama occurred when AFC refused to play Gor Mahia in the opening round of the KPL top 8 tournament. Perhaps they were apprehensive about meeting a Kogalo team that suddenly was in fine form. If anyone doubted Gor Mahia were back at full strength, those doubts were disposed of when Gor Mahia beat Tusker 4-0 aggregate to eliminate them from the FKF top 8. It was ample revenge for having lost the Super cup to Tusker. They also trounced Borabu Chiefs 5-2 in the opening round of the FKF cup. And on August 19, Gor Mahia wrested the KPL top 8 tournament by beating Ulinzi 2-0 in extra time. The moment to remember in 2012 came in September 23 when Gor Mahia beat arch rivals AFC Leopards 2-1 thanks to goals from you know who; Rama and Sserunkuma. The win erased the gap between league leaders AFC and Gor Mahia. Prior to the game, Logarusic had gone home to Croatia for a week and only arrived a day before the match. The race for the league was now tighter than ever with the top three teams all within 2 points of each other. Playing 4 matches in two weeks almost took its toll in Gor Mahia as they struggled to beat Muhoroni youth on penalties in the quarter finals of the FKF cup. In Mid October there was disquiet between the club and sponsors Tuzo. It emerged that Tuzo had not released funds in months and players were going without pay. After Gor Mahia drew with Mathare, a furious Logarusic lashed out at Tuzo. It turned out that the ill advised jacket deal which Gor Mahia reached with nation newspapers was in violation with the sponsorship deal with Tuzo. Then came a crucial win over Karuturi sport that kept Gor Mahia in the hunt. A week later Gor Mahia beat Tusker 1-0 and and suddenly their destiny was in their hands. With Gor Mahia in pole position, Gor Mahia trounced Muhoroni 4-0 to set the stage for the final match of the league. It was the most anticipated weekend in the history of the Kenya Premier league. Unfortunately Gor Mahia did not rise to the occasion, drawing 1-1 with Thika United. The title had slipped away at the last moment. However a week later Gor Mahia fans had a reason t celebrate when they beat archi rivals AFC 2-1 in the semi finals of the FKF cup. Goals came from Kevin Omondi and Moses Odhiambo. In the finals , Gor Mahia beat Sofapaka 3-0 on penalties with keeper Ivo Mapunda providing a penalty saving clinic reminiscent of the legendary Mahmoud Abbas. Dan Ssserunkuma was voted Footballer of the year. Logarusic was voted coach of the year and Anthony Akumu midfielder of the year. Thus there was much to celebrate despite the fact that the league slipped away at the last moment. Had it not been for the poor start, Gor Mahia would have won the league by a significant margin. In fact over the past 4 years, poor starts have put paid to Gor Mahia chances of winning the league. Zdvarko Logarusic will go down as one of the best coaches ever to coach Gor Mahia alongside Len Julians and Vojo Gardasevic. 1. The club must have an established coach in place before the season to avoid poor starts. 2. Signings must be vetted by the coach to ensure the signed players can fit into his system. 3. A qualified physiotherapist is critical in order to avoid injuries. 3b. Injuries can be reduced by giving players plenty of off season rest. If the annual tour of Nyanza is undertaken, use second tier players who played limited minutes. 4. If a qualified coach is not available locally, the club must not hesitate to look overseas. @ blogger our club house is “TOK KOMWANDA” adjacent to KALOLENI estate and opposite “BURMA” market whete there is plenty of traditional food. What else are you asking for?. Or do you mean K’Ogalo to acquire the asset and own it. GOR MAHIA can as well switch to kisumu ” MOI STADIUM” as there home ground and train at “Jomo Kenyatta” sports ground. As matter of fact this will help kisumu grow in local tourism by Ma-fans flying or driving to the lake side city. by village minded siblings any time we play in Nairobi. Food for thought.!!!!!!! Wish kogallo the best next season and at least the EC learnt that giving a coach free hand can change the team alot.Playing is in the field not within the office. Now that Kevo and Were have been forgiven, let them go back to Harambee Stars squad in Kampala. I know as much as they did wrong we will need them, especially is in semis where we may again play Uganda. Lakini waachane na mambo ya pombe na wanawake at their age if they have to go far. If they can’t control their appetite then they better marry. 3) If Koops is avaiable and interested we can give him a chance to coach Kogalo, I believe just with Loga we can do wonders with him but so long as we give him a hand in handling the team. We should note that coaches success laso depends on the team culture which the coach has to adopt. Owino, who has had a successful season with Gor and the national side, emerging as one of the best players in Stars’ two matches at Cecafa, could also be a hot cake. “I can confirm Matano approached me and has given me an irresistible offer. I still have a contract with Gor Mahia of slightly more than one year, but I believe the two clubs can meet and reach an agreement,” said Owino who noted that he is keen on first team football. At Gor, Croatian coach Zdravko Logarusic preferred Donald Mosoti and Ivan Anguyo in central defense instead, of the non nonsense Owino, forcing him to warm the bench for the better part of the season. When he was given a chance to play, Owino was deployed as a fullback or defensive midfielder, positions the former Karuturi man say he is not comfortable with. Well on owino, personally i would ask him to make decisions along professional considerations. This includes playing time, valuabiity at GM and finances. More importantly if loga will be back then he should leave coz loga has very little regard for him due to height irrespective of his effectiveness vis a vis others. But if loga won’t come then definitely he can earn a first team place at GM. Otherwise him and Atudo have crafted a tight wall of defence noticiable by all and matano has rightly seen this. @7 Dan – Koops is a good coach but will he be able to stand his ground when it comes to player selection and discipline of the players? @7 Dan, why do you support recycled lots…Koops with the indecipline in AFC…what a gamble…we should just look outside the country and bring a Europe trained coach with all the required credentials. But note that coaches come and go. Also note that Gor Mahia is a big club with huge following in Kenya and other East African countries. In this regard, we need a seasoned coach. God knows i never threatened Anaba. He was my friend till he left kenya. it was ken odiahmbo who wanted a part of my fee and i refused and he started faulting me.